Patients in New York, New Jersey, and the greater Boston area trust the hair restoration experts at True & Dorin Medical Group. The reason for this trust is our belief that each patient should receive fully customized hair transplantation surgery that emphasizes natural results and patient satisfaction. A great way to achieve the latter is to provide ample information about our approach and why it makes a difference. With that in mind, we'd like to consider the nature of a man's hairline and help you understand the factors that help us craft a restoration surgery strategy. Is there really such a thing as a masculine hairline? Though you may not have thought much about it, there is a general sense of what constitutes a masculine hairline and what constitutes a feminine hairline. In general, male hairlines produce a kind of U-shape, meaning that the hairline is its lowest in the middle of the forehead and highest at the temples. By contrast, many female hairlines are the opposite of male hairlines: they form a reverse U-shape, with the lowest part of the hairlines at the temples and the high portion of it in the middle of the forehead. Obviously these shapes are much more subtle than we're suggesting for illustrative purposes, and we strive for naturalism with all results. We also acknowledge that not everyone is the same when it comes to their hairline. That said, this consideration is important when it comes to performing a hair transplant procedure. By examining the patient's balding pattern and the general nature of male balding patterns, we can generally find the natural shape that best fits a patient. We'll sometimes ask to see older photos of the patient with hair for just such a reason. Facial structure and facial features play an important role in defining the right placement and shape of the hairline as well. One of the most important considerations is whether the restored hairline is situated high on the forehead or low on the forehead. The patient's previous hairline is considered along with overall facial aesthetics to determine how to get the best results. Last month we noted the unique concerns when performing hair restoration surgery on African American patients. A patient's ethnic background helps define the right shape and angle of the hairline and how we can make the end results look most suitable. Again, this is all part of ensuring that the results of a hair transplant seem like the head of hair you were born with. When it comes to placing the follicular grafts themselves, another important consideration is how to distribute the hair for a result that looks best. Rather than using even distribution of each graft, we purposefully stagger the placement of the follicular units. This allows us to make the final results of surgery look the very best. During your consultation with our team, we will be sure to work closely with you and provide information about each step of your treatment. This will provide you with the information you need to make smart choices and feel empowered by your decision to undergo hair restoration. 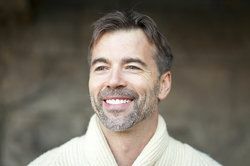 For more information about treating baldness and your many other options for reversing male pattern baldness, be sure to contact our hair loss doctors and hair restoration specialists today. The entire team at True & Dorin Medical Group will work with you to ensure that your surgery is as successful as possible.